Which Roland Synth is Right for You? Each model has its own unique features and advantages. All of them are easy to use, and incorporate the essential bass sounds and real-time controls needed to keep a bassist at the top of their game. The GAIA SH-01 looks and feels like it was designed with the bass player in mind. 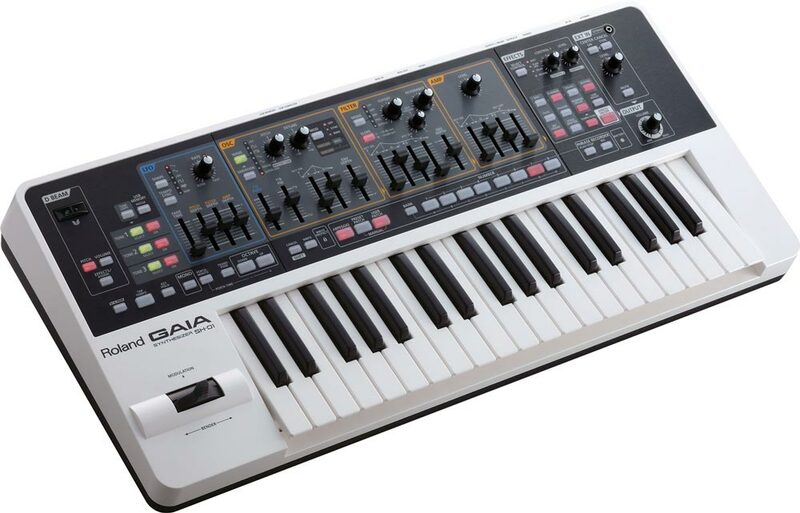 It features a very logical arrangement of synth parameters, and each has its own dedicated control for instant access. More importantly, the GAIA SH-01 cranks out impressive, fat synth basses with a three-oscillator sound engine and up to five simultaneous effects, including a massive-sounding low boost. The panel layout of the GAIA SH-01 is simple to grasp. It’s equipped with well-arranged knobs, sliders, and buttons that match the signal flow of the patch, making it quick and easy to tweak preset patches or program your own original sounds. The front panel of the Roland GAIA SH-01 is loaded with hands-on controls for creating and tweaking sounds. If sound design is not something that interests you, don’t worry. The GAIA SH-01 comes with 64 preset sounds that are suitable for all types of electronic music, and there are lots more available for free at Roland’s Axial site. You have the ability to store 64 user sounds on board as well, and another 64 via a removable USB key. Compact and easy to carry, the GAIA SH-01 weighs about 9.5 pounds and features a 37-note velocity-sensitive keyboard. It can also run on batteries if needed—great for practicing or programming sounds on a tour bus, or in any situation where AC power is not available. 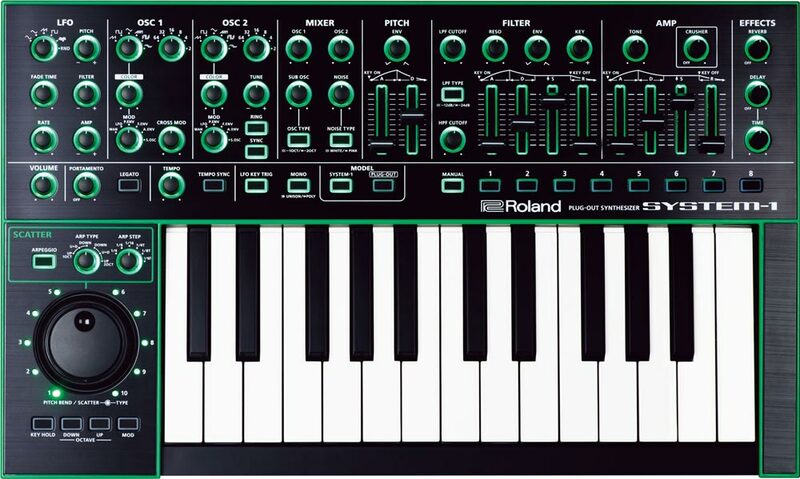 The SYSTEM-1 PLUG-OUT Synthesizer is probably the most compact synth that Roland has ever made. It weighs in at just under 5.5 pounds, and features a durable, space-saving keyboard with 25 full-size waterfall keys. The SYSTEM-1’s footprint was designed for optimizing space in any setup, and it’s small enough to go into your gig bag, backpack, or carry-on luggage. But don’t let the small size fool you—the SYSTEM-1 is a sonic monster that’s the “transformer” of synthesizers. On its own, the SYSTEM-1’s main synth engine provides massive sound with four fat oscillators (including a sub oscillator). All parameters have dedicated physical controls, and the knobs and faders are equipped with backlighting to ensure visibility on dark stages. 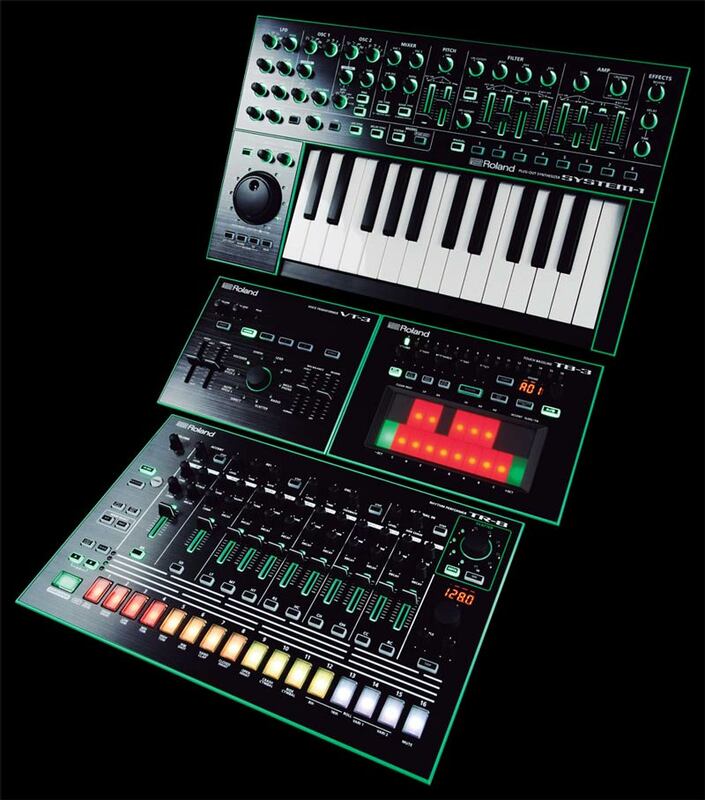 The SYSTEM-1 integrates seamlessly with other products in Roland’s AIRA series. A typical way that you might use the SYSTEM-1 on stage is to have some onboard sounds programmed in the main engine, and a PLUG-OUT synth like the legendary Roland SH-101 (an EDM staple) or vintage SH-2 loaded as well. With the Version 1.2 update, you have quick access to eight patch banks, giving you a total of 64 patches for a live gig. The JD-Xi is another Roland synth with a small footprint, making it ideal for synth bass duties. But it has an additional cool feature that really makes it stand out—the JD-Xi is a true hybrid instrument that’s equipped with both analog and digital sound engines. This unique crossover design gives you the warm, smooth response of classic analog and the versatility of modern digital, all in one compact synth. The JD-Xi is a compact crossover synth with analog and digital sound engines and 37 mini keys. The JD-Xi’s monophonic analog synth section includes saw, triangle, and square waveforms with pulse-width modulation, plus an analog low-pass filter. There’s an independent sub oscillator as well, which is great for bringing extra low-end power to your bass tones. In addition to the analog engine, the JD-Xi has two digital synth sections with 128-voice total polyphony and high-quality tones powered by Roland’s acclaimed SuperNATURAL technology. There are many digital tones that sound great for bass parts, plus synth pads, electric pianos, strings, brass, and many other sounds for playing normal polyphonic keyboards parts. With its 37 responsive mini keys, the JD-Xi gives you three octaves of range in a modest space, and many hands-on controls are available for tweaking sounds on the fly. The JD-Xi also includes many other tools for more advanced music making, such as a detachable gooseneck mic and built-in vocal effects, onboard drum sounds, an intuitive four-track pattern sequencer for creating loops, and more. The FA-06 Music Workstation is a 61-note instrument with full-size keys and lots of real-time control. It’s a great choice if you want to grow beyond synth bass to play other keyboard parts on stage, or if you need an instrument that does double-duty as the centerpiece of your music production setup. And with its onboard sequencer and audio playback capabilities, the FA-06 is also ideal for playing backing tracks live. Ready to support any type of music you play, the FA-06 includes a massive sound collection inherited from the flagship INTEGRA-7 sound module. As such, the FA-06—and its 88-note sibling, the FA-08—offer the largest array of bass sounds of any current Roland keyboard, with everything from analog-style synths to electric basses to upright acoustic sounds. In addition, the Roland Axial site provides many free patch collections, plus new sounds that can be downloaded into the FA-06’s virtual expansion slot. While the FA-06 is a 61-note instrument, it’s still light (under 13 pounds) and easy to carry, so it won’t break your back moving it from gig to gig. Unlike other workstation keyboards, it also starts up in seconds, a particular benefit for live use. The FA-06 is both flexible and accessible. The streamlined panel is logically organized into dedicated sections, with a big color LCD and tons of dedicated buttons, knobs, and sliders. The Sound Modify section is ideal for live control of essential synth parameters, special performance effects, and more. For optimum organization, the FA-06 also provides a Favorite mode, so you can organize your most-used sounds into banks for instant access on stage. Sound Modify section on the FA-06 front panel. Since the FA-06 is a multi-timbral instrument, you can layer sounds on top of each other to create the ultimate in supersize bass sounds. Each sound has its own dedicated multi-effects unit, while the master effects section allows you to add compression, EQ, and TFX (including filter and subsonic bass) to the overall output. Going beyond synth bass, the FA-06 is a full-featured workstation that offers extensive creative capabilities. With a 16-track sequencer, built-in performance sampler, USB audio/MIDI for computer integration, and much more, it’s an ideal command center for music production on the road and in the studio. 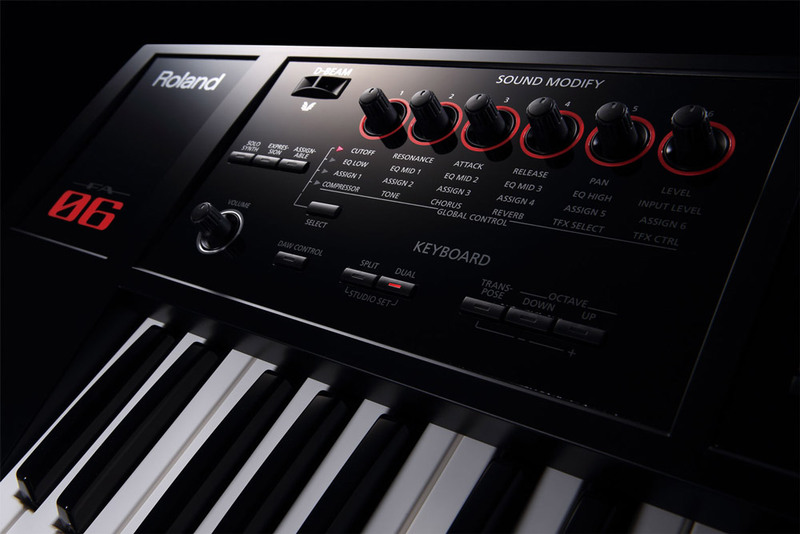 Visit the synth product pages at RolandUS.com to learn more about Roland’s entire synthesizer lineup.